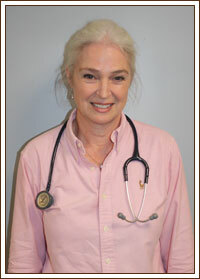 Home >> Our Providers >> Diana Reynolds, M.D. Dr. Diana Reynolds, originally from New York, has lived in Charleston, WV for over 25 years. She received a bachelor's degree in chemistry from the State University of New York, College at Purchase, prior to attending medical school at New York Medical College. After completing a residency in pediatrics and a year as chief pediatric resident at Georgetown University Hospital in 1991 she spent the next 17 years as an emergency department attending at CAMC Women and Children's Hospital. She has been in private practice for nine years. Dr. Reynolds and her husband, Kenny Kemp, chief photographer at the Charleston Gazette, have five children - two girls and three boys. They have nine cats, two dogs, and 14 chickens. They enjoy boating, gardening and family movie nights!